Let’s do another Glenmorangie. 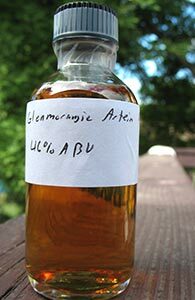 Alas, it’s another NAS whisky—Glenmorangie have released so many of them. Unlike the Tayne, the Taghta is not part of their current lineup. It was a limited edition released a few years ago and was said to be a crowd-sourced whisky with all aspects of the selection of the whisky apparently having been voted on (“Taghta” is apparently Gaelic for “chosen”). From various sherry/wine finishes a Manzanilla finish was selected by whoever did the voting. I’ve read some reports that indicate that this is the regular 10 yo plus a finish but there’s no official word to that effect. I guess the crowd that selected it didn’t get a say in the age. Unlike the Tayne, it’s at 46%, so it’s at least got that going for it. Anyway, let’s see what it’s like. 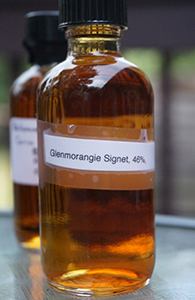 Here is another of Glenmorangie’s special edition whiskies (though this is, I think, an ongoing small batch release). Unlike the Ealanta, the Signet carries no age statement, but like it it has somewhat unusual origins. Whereas the Ealanta’s claim to difference is its 19 years in virgin oak casks, the Signet’s claim to fame is both the use of roasted “chocolate barley” malt as well as “designer bespoke casks”. What exactly makes the casks different or how much of the malt used is the special kind, I’m not sure. The information is probably out there but I’m too lazy to check. I’m not in the business of providing information, after all, only unreliable reviews. 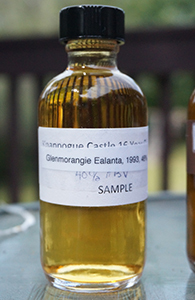 This was the 2013 release in Glenmoangie’s “Private Edition” series. Not having cared overmuch for most of the others I’ve tasted (the Artein and Companta, for example) this is not in and of itself a huge recommendation for me. Then there’s the fact that this has been aged for 19 years in heavily charred virgin oak casks—I’ve not generally had a good track record with whisky aged in virgin oak casks, though I will grant that I’ve never had one aged for 19 years in virgin oak. It was expensive on release, as most of these Glenmorangie limited editions are, but at least it has an age statement. Here is the latest special release from Glenmorangie, or to use their lingo, “the fifth release in the Private Edition”. As to what’s private about it, I don’t know considering that I have a bottle of it. Those who are aware of my aversion to wine cask-finished malts, and particularly those who remember my last outing with one such from Glenmorangie, may be surprised to see me with a bottle of this. I didn’t actually “buy” one–I traded some samples for it with another whisky geek who really didn’t like it. There’s been some interesting talk about it and morbid curiosity led me to want to check it out. Let’s take a deep breath and see how it goes. This is a classic whisky, one that’s been the gateway malt for a good number of drinkers, I’d imagine. If you’ve ever wondered what the quintessential Northern Highland profile is, this is it (though fans of the Old Pulteney 12 and the younger Balblairs may disagree). Given all the crazy (and ongoing) experimentation at Glenmorangie in the LVMH era this entry-level malt gets forgotten in the hoopla over the various exotically finished or put together annual releases. 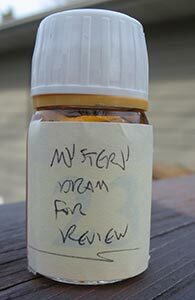 This is a mystery whisky my friend Rich recently gave me with no name or any other details attached. The plan was that I would review it and send him my notes and he would then reveal where it’s from, how old it is, what kind of wood etc.. Neither he or I are interested in seeing if I can identify the distillery. That’s a mug’s game (and one that I have a terrible track record with for anything that’s not Bowmore). The exercise is really to see what I come up with without preconceptions of any kind. Well, I am excited to see what this is like and just how wrong my guesses about age etc. will be. 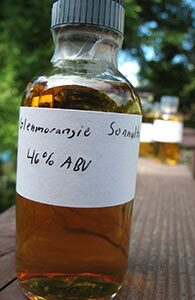 After the Artein disaster I’m hoping for good things from this sample of Glenmorangie’s Sonnalta, which is matured for 10 years in ex-bourbon casks and then “finished” for two years in Pedro Ximinez sherry casks. PX sherry, as the maltheads and old English ladies know, is particularly sticky and sweet. 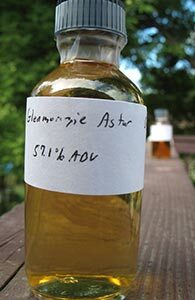 More robust distillates, such as Glendronach’s, hold up well to the cloying PX character, as does Lagavulin (in its Distiller’s Edition incarnation), but how will a more delicate distillate like that of Glenmorangie fare? 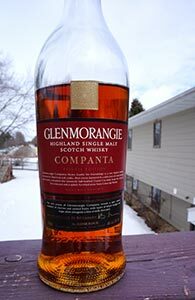 This ends my mini-run of recent’ish Glenmorangies and begins a slightly longer run of reviews of sherried malts. There are a couple of particularly decadent treats coming soon. The Artein was released a year or two ago. It’s a vatting of whisky from 15 year old and 21 year old Glenmorangie finished in Sassicaia casks (a so-called “Super Tuscan” Bordeaux-style red wine). There is twice as much 15 yo as 21 yo whisky in the vatting. I can’t say I’ve loved too many (any?) red wine finished whiskies but let’s see what I make of this one. Glenmorangie was the distillery that first got me interested in single malt Scotch just over a decade ago. Granted this was largely because I was very attracted to the idea of their old lineup of wine cask finished malts; I had an ambition to one day own all of the releases in the old “Sherry/Burgundy/Port/Madeira Wood” range. I never quite got there–I think it was the Burgundy Wood that cured me of that ambition–and I grew to like the simpler 10 yo instead.